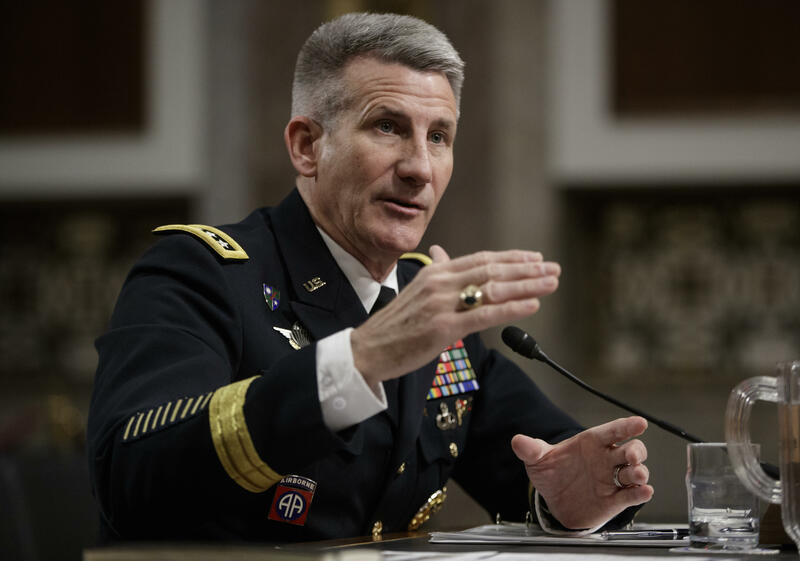 Top U.S. commander in Afghanistan says war "still in a stalemate"
The top U.S. military commander in Afghanistan said the war there is "still in a stalemate," but on an upward trajectory in an interview with NBC News Thursday. "We are still in a stalemate," Gen. John Nicholson said in an interview airing on "NBC Nightly News With Lester Holt" Friday. "We are only 90 days into this new policy, but with the U.S. forces that will be arriving, with the new authority that we have been given, put the pressure on external enablers, with the fact that we are condition based and not time based, we've set all the conditions to win." In late August, Mr. Trump delivered a major speech on America's longest war that offered few specific adjustments in U.S. strategy, and although that speech offered few specific details, it was soon followed by an increase of 3,000 troops. That increase brought the troop level to roughly 14,000. Mr. Trump focused on the progress in Afghanistan in a videoconference with troops there on Thanksgiving from his club Mar-a-Lago in Florida, saying the military members on the ground "turned it around over the last three to four months like nobody has ever seen." "And I have to say, just directly to the folks in Afghanistan, everybody is talking about the progress you've made in the last few months since I opened it open," Mr. Trump told the troops. "We opened it up. We said go ahead, we're going to fight to win. We're not fighting anymore to just walk around. We're fighting to win. And you people are really -- you've turned it around over the last three to four months like nobody has seen. And they are talking about it. So, thank you very much -- brave, incredible fighters." Nicholson told NBC News he has the confidence of the president, and he has confidence in the president's strategy, which has given momentum to the U.S. and her allies. "This change in policy has reversed this decline that we've been in since 2011," Nicholson told NBC News. "And what I would say is that we've drawn down too far and too fast, we communicated to the enemy that we had lost our will to win, and now with a new policy as of August, we are going to win. And winning means delivering a negotiated settlement that reduces the level of violence and protecting the homeland." On Friday morning, Mr. Trump lamented U.S. involvement in the Middle East. He called it a "mistake" that the U.S. became involved in the first place, but promised to "get it all done" regardless.